The BA-N series, are three independent smoke ways steam generators of one sigle way. 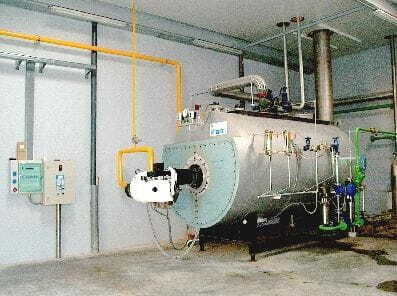 On them, the firebox, composed of a cylindrical combusion chamber, with a back wall fully wrapped up by water -wet chamber- and two smoke ways leading to the smoke flue gas to the duct for gases expulsion. This design has many advantages, which would highlight a low temperature in the combustion zone, resulting in lower emission levels of nitrogen oxids (NOx) and a high average yield. Also with these BA-N generator, the thermal volumetric load in the firebox is much lower, resulting i a further reduction in the levels of NOx. BA-N series features for accommodating a large volume of water. This affects a significant heat accumulation and a reduction in the starts of the burner, causing a significant decrease in the levels of gaseous pollutants and also giving a very favourable quality of steam.